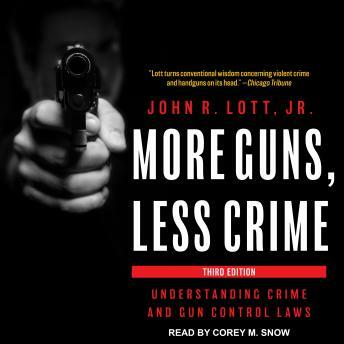 On its initial publication in 1998, John R. Lott's More Guns, Less Crime drew both lavish praise and heated criticism. More than a decade later, it continues to play a key role in ongoing arguments over gun-control laws: despite all the attacks by gun-control advocates, no one has ever been able to refute Lott's simple, startling conclusion that more guns mean less crime. Relying on the most rigorously comprehensive data analysis ever conducted on crime statistics and right-to-carry laws, the book directly challenges common perceptions about the relationship of guns, crime, and violence. For this third edition, Lott draws on an additional ten years of data-including provocative analysis of the effects of gun bans in Chicago and Washington, D.C-that brings the book fully up to date and further bolsters its central contention.